Alpine and cross-country skiing are exhilarating sports, but the exhilaration may mask a muscle strain or injury. Knee pain may occur hours after skiing. 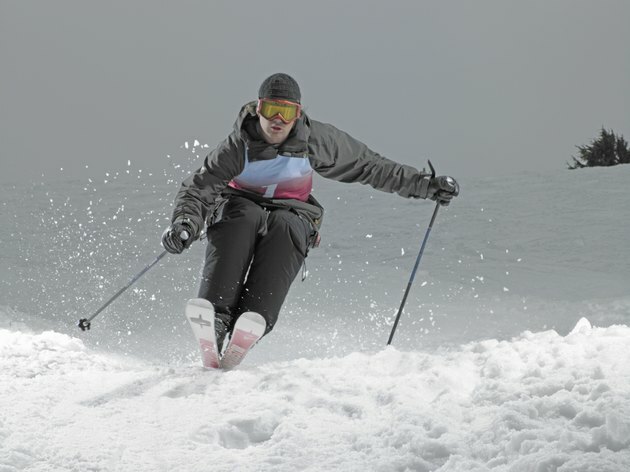 Poor technique, improper equipment, muscular overuse and fatigue and injury are factors that contribute to post-skiing knee pain. Understanding the mechanisms that triggered the pain may help you prevent it. Ski racers look as if they are using extreme muscular strength and endurance to execute their turns, but looks are deceiving. Ski instructors advise that the shorter, lighter and curvier shaped skis require more balance and finesse than their 220 cm ancestors. If your instructor tells you that you are "muscling your turns," you might be guilty of using large muscle movements, instead of the smaller, fine motor foot and ankle movements for turn initiation. Your kneecaps do not appreciate the excess flexing, hyperextension and twisting, and respond by causing pain. Muscling your turns usually causes pain on the inside of the knee at the joint line. . Your friends or your significant other may tell you that you can definitely ski that super-advanced double-black diamond trail, but your heart tells you that it is way beyond your abilities. Nonetheless, you ride the lift and ski to the top of the trail. Looking down, your instincts tell you that you are not ready for this. Colorado ski instructors describe this as the "no vs. go syndrome, " which causes your body to tense your muscles in an attempt to keep you from surrendering to the forces of gravity. The fear causes you to lock your knees and shift your weight to the tails of your skis. Even if you survive the run, the backs of your knees may hurt later in the day. Age-related changes in collagen may trigger knee pain, advises Dr. Kevin Stone, former physician for the U.S. Ski Team. Brittle knee cartilage reduces your knees' shock absorption capabilities. The impact caused by landing from a jump and the jolting moves characteristic of mogul skiing transmits into the knees, which are less protected from the shock. As your knee cartilage stiffens, your knee ligaments also lose their elasticity. Dr. Stone advises baby-boomer skiers to engage in a year-round stretching and strengthening program, and to modify their terrain choices. Ski injuries such as the anterior cruciate ligament tears and broken legs cause immediate pain. If you strain, sprain or tear your medial collateral ligament, called the MCL, you might be able to keep skiing, but your knee will hurt later in the day. MCL strains usually occur when an outside force causes over-stretching of the inner ligaments. Spending excessive slope time in the snow plow or wedge position also put excess strain on the inner knee joints, says orthopedist Edward Staub, clinical professor at Yale University Medical Center. If, after skiing for a year, you are still using the wedge position, your technique or equipment may be at fault. Take a lesson with a certified instructor, and have a professional boot fitter check your gear.